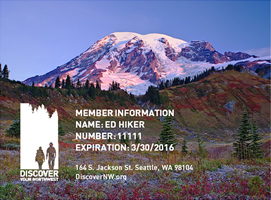 If you are looking for a map that will provide you the most comprehensive navigational means around the majestic Mount Rainier, look no further! This National Geographic Trails Illustrated topographic map includes trails, elevations, campgrounds, a detailed depiction of Mount Rainier, and more. With helpful regulations, precautions, and "Leave No Trace" guidelines, this map will not only guide you in plotting a course, but will also aid you with helpful tips through America's fifth oldest national park. Also included are a brief history, visitor information, and a general list of activities. Printed on waterproof, tear-resistant material with a plastic coating, this map will withstand natural wear and tear as well as all kinds of inclement weather. Features: Waterproof. 2003. Scale: 1:55,000 & 1:27,500. 4 x 9 inches folded; 28 x 32 inches opened.